The Miconex Gift Card programme offers a simple way for a town, city or Business Improvement District (BID) to encourage people to buy a local gift for friends, family and colleagues. It is based around a prepaid Visa card and is expanding nationally, having proven its value: before Christmas 2017, the five active local programmes will be joined by a further six launches. 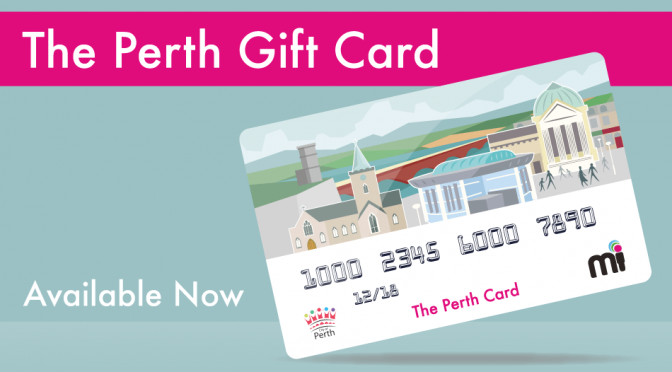 Launched in December 2015, Perth’s Gift Card – which was the national pilot – made an immediate impact. “Initial sales went well,” explains Colin, “thanks to the support and promotion provided by Perth & Kinross Council”. Through the first year alone, there was £45,000-worth of additional spend in the city. Before the pilot, Miconex was already managing Perth City’s digital marketing, and promoting local businesses online via mi Perthshire. “We knew we had the local knowledge, networks and infrastructure to develop a Perth Gift Card, but we had to win the contract in an open tender first,” adds Colin. It’s easy for businesses to sign up, as it uses the existing Visa network, with no new software, hardware or extensive training needed. It provides detailed reports, so managers can see how much is being spent and where. Businesses don’t have to redeem anything (unlike gift vouchers). The money goes straight to them. Customers find it easy to use as it’s just like any other payment card. There are now 85 businesses signed up to Perth’s card, and sales are on track to top £100,000 by the end of Year 2. The successful pilot quickly sparked interest from other centres, and Kendal, in Cumbria, and Glasgow’s cosmopolitan West End, in the form of the Byres Road & Lanes BID, were early adopters. One key appeal for Kendal was that the Miconex card can be used by multiples. In Kendal, Boots, Mountain Warehouse, Booths, Beales and Pizza Express all participate, as well as independent shops. These businesses have their own gift cards, but realised that the Kendal Card adds to their customer base. Kendal has signed up 130 retailers – in a town of just 24,500 inhabitants. Another early adopter was the Isle of Arran – Tripadvisor’s European Island Destination 2016 and, according to CNN, one of the top seven islands in the world. No surprise then that the local economy relies heavily on the thousands of tourists who visit every year. With more than 60 shops, hotels, accommodation providers and attractions participating, the ArranCard can be used by both locals and visitors, proving the flexibility of the programme in response to specific local requirements. “We work closely with each new destination to tailor programmes that are perfect for their specific needs,” explains Colin. Less than two years after the initial pilot, there are now more than 500 participating businesses across the UK, and that number could more than triple in the next year. For Miconex, the programme’s rapid expansion has led to the team expanding in Perth, with further recruitment expected in 2018. “As the programme expands nationally, we will still base operations here in Perth, as connections from the city are great across the UK and the outstanding quality of life offered helps us recruit and retain the best staff,” adds Colin. This Perth-based innovation is proving a win-win for this city business, dozens more within the city, and hundreds of UK businesses.